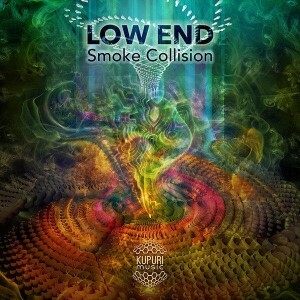 Kupuri Music presents Smoke Collision, the debut release from Low End (Pablo Pascual) from Mexico. Combining organic elements, wicked electronic bass-lines, and a hint of glitch, Low End brings forward a fine work of psychedelic art that will resonate with your soul and mind. Mastered by Ulises Pascual @ LowRange Studio, Mexico City, with artwork by Fabián Jimenez AKA Farbo. MP3 Download | FLAC Download | WAV Download · Download count: 4,525. The cover art looks really great, will be listening to this in a few hours. I removed an abusive comment… please remember: constructive criticism is always welcome but abuse is not! Why there should be criticism on something artful? Presently I do not want to judge on people’s art anymore… Individuality is individual and should be “judged” only if the artist allowed, should not? But we can give neutral comments..?! An artist creates to connect and share personal experiences with the world around them, every artist must understand that not all share the same opinions. While productive criticism is what will make an artist feel as though their work was not in vain, neutral and negative criticism should be just as acceptable for they are reality. Reality should never be pushed to the side for the sake of social housekeeping. If you don’t like the way the music sounds then say so, maybe even give your opinion on what would make it better. There artist gets the choice to read it or not if they are interested in the opinions of others. Judging other people’s art is what makes the world go round. This release has some heavy jazz stylings and a large dose of experimental. It’ would be pretty good (if that is what I had expected from the description) but it’s not a usual sound for Ectoplasm. I was turned off at first because “downtempo” and “glitch” don’t describe the content.